In Defence Of STAR TREK V: THE FINAL FRONTIER | Warped Factor - Words in the Key of Geek. Matthew Kresal ventures to The Final Frontier. Recently, my fellow scribe Dr. Moo ranked the thirteen big screen Star Trek outings. At the very bottom of the list, he placed 1989's Star Trek V: The Final Frontier. Given its perhaps less than stellar reputation in the Trek community, that's perhaps understandable since it's viewed as the film that failed to live up to expectations and the one that nearly killed the franchise on the big screen. I don't think that's fair to the film though. Don't get me wrong, it's a film with problems. Perhaps the most noticeable of which is its special effects. The big screen adventures had brought Star Trek a long way from its sometimes iffy TV effects but The Final Frontier saw that trend sputter a bit. Compared with previous installments in the series, which had lower budgets, the effects here are unconvincing, including the model shots that had previously been a point of pride. Even the more original sequences are a let down, such as when the Enterprise enters the Great Barrier, which could have potentially rivaled the incredible imagery of V'Ger in The Motion Picture. 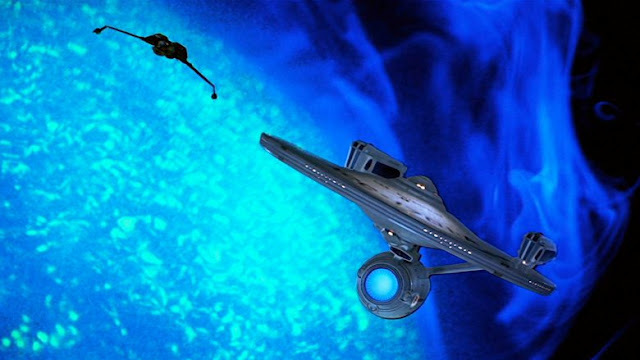 Instead the sequence becomes a series of unconvincing model shots in which the Enterprise looks pasted onto the screen as lighting and clouds swirl around. The problems with the special effects go farther as well as they ultimately robbed the film of its intended ending and instead left it with one that feels anti-climactic. It's a disappointment to be sure and one that makes The Final Frontier feel admittedly inferior. Another big problem is in the script, or at least in its focus. Star Trek has always been an ensemble show from practically the first episode, and while that can be something difficult to bring over to the big screen the earlier Trek films had managed the transition smoothly by focusing on the core characters (Kirk, Spock and McCoy) while giving everyone their moment to shine. The Final Frontier, though, primarily focuses on the character of Captain Kirk while giving mere lip service to many of the other members of the cast, something that perhaps isn't surprising given that William Shatner is not only the director but co-credited with the storyline the script is based on. Kirk is at the center of the action throughout as well as being a voice of sanity, sometimes absurdly so. Those familiar with Shatner's later Kirk-centric Star Trek novels from the 1990s and early 2000s will recognize many of the tropes in play, but whereas Shatner was kept in check more in those books, here he is given free reign, to the detriment of the film. Which brings us to the other problem, one that Dr. Moo seized upon in particular: its humor. Following in the wake of the almost whimsical The Voyage Home, it was perhaps natural to try and include that kind of humor in the next film. However, how it was done in The Final Frontier does come across poorly at times through largely forced bad jokes to moments that undermine much loved characters such as Uhura or Scotty (though the infamous scene of the latter hitting his head actually works quite well in context). Once the film enters its last act, the humor goes by the wayside but it effects so much of the film that it's impossible not to notice it. Yet The Final Frontier does rise above these flaws. At its heart, despite its focus on Shatner's Kirk, the film focuses on the core relationship at the center of the series: Kirk, Spock and McCoy. Carrying on what was built in Wrath Of Khan and its immediate sequels, The Final Frontier sees that relationship being pushed to its limits once again. This time not by a superman or by death itself but by a Vulcan seeking the answer to some of the questions we all face in our time on this planet: is there a god and where did this universe we occupy all start? There are some interesting moments between the key trio that range from attempts at humor early in the film to oddly revealing as it draws towards its conclusion, which gives DeForest Kelly one of his strongest moments as McCoy in a semi-flashback scene. It's a film that deals with its lead characters in interesting ways when it isn't too focused on one in particular. The other thing is that its really about ideas. 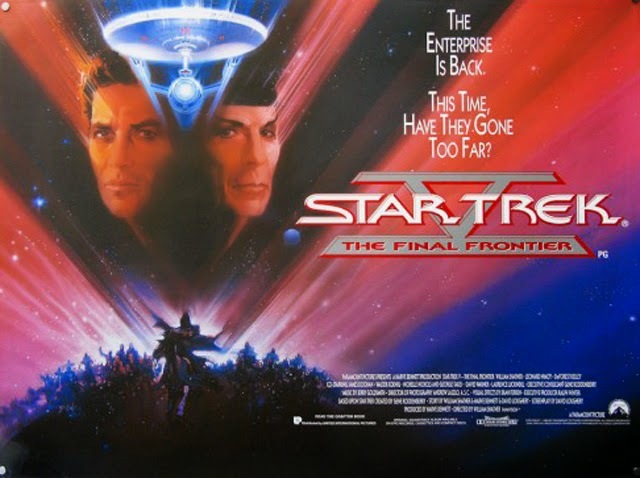 Whereas Nicholas Meyer and Harve Bennett had shifted the series into more familiar action/adventure territory, The Final Frontier takes it back into territory that seems like it could have been explored in the TV series, potentially. It uses the Sybok character (Spock's half-brother which, as character revelations go, could be better but also could be worse) and the quest for Sha Ka Ree to raise interesting questions about the nature of belief and fundamentalism, which seems oddly prescient in a world dealing with religious inspired terrorism. That it also raises the question of the dangers of those beliefs while also suggesting that they are inherent part of us is also to the film's credit. It tries to do this within the more familiar action/adventure format, but never quite succeeds. However, the journey along the way is still intriguing and watchable. In a different world, The Final Frontier could have been an engaging sci-fi action/adventure film with heart and interesting questions. As it stands, it's a film that is over-ambitious to a fault, but I find myself more forgiving of it for trying to do something different rather than just playing by the the book while trying to claim it's something greater (as happened with Next Generation films like Generations or Insurrection). Is it the weakest of the Original Series films? Possibly. The worst in the whole series? Matthew Kresal lives in North Alabama where he's a nerd, doesn't have a southern accent and isn't a Republican. He's a host of both the Big Finish centric Stories From The Vortex podcast and the 20mb Doctor Who Podcast. You can read more of his writing at his blog and at The Terrible Zodin fanzine, amongst other places.